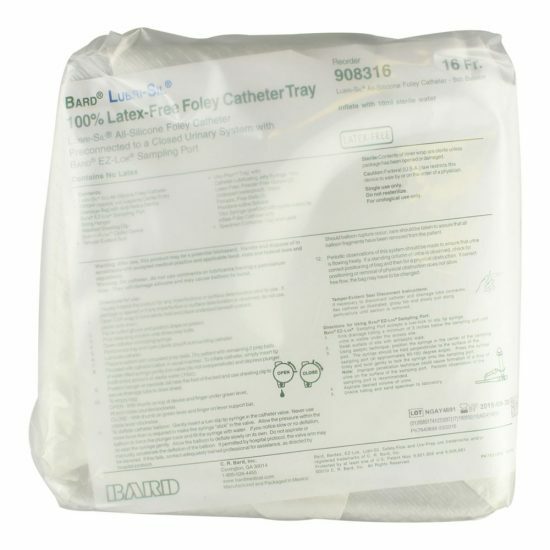 The BARD LUBRI-SIL drainage bag Foley tray features a 5cc LUBRI-SIL Foley catheter pre-connected to a BARD 2000ml drainage bag and includes the URO-PREP Tray. The LUBRI-SIL Foley catheter is 100% latex free and provides for smoother insertion and enhanced patient comfort through the hydrogel coating’s unique ability to absorb fluid, thus creating a hydrophilic “cushion” between the catheter surface and the urethra. The BARD LUBRI-SIL drainage bag Foley tray is also available with the BARD SAFETY-FLOW outlet device which eliminates urine splash when emptying the drain bag.